The legacy of Moroccan artisans is well known throughout the world. As once vibrant communities, Moroccan artisans turned windswept garrison towns into iconic, UNESCO world heritage cities — by hand. The cities artisans built, such as Meknes and Fez, now serve as centuries-old reminders of the towering potential of Moroccan artisans when they work together as a part of a larger community. Today, however, Moroccan artisans hardly resemble a community. Instead, artisans are individuals trapped in the belief that their work is a zero sum game. With no community, the potential and wealth of artisans is divided amongst numerous fiefdoms of resellers that dominate the Moroccan artisan market. It is no surprise then that artisans continue to be impoverished despite their tremendous skill. 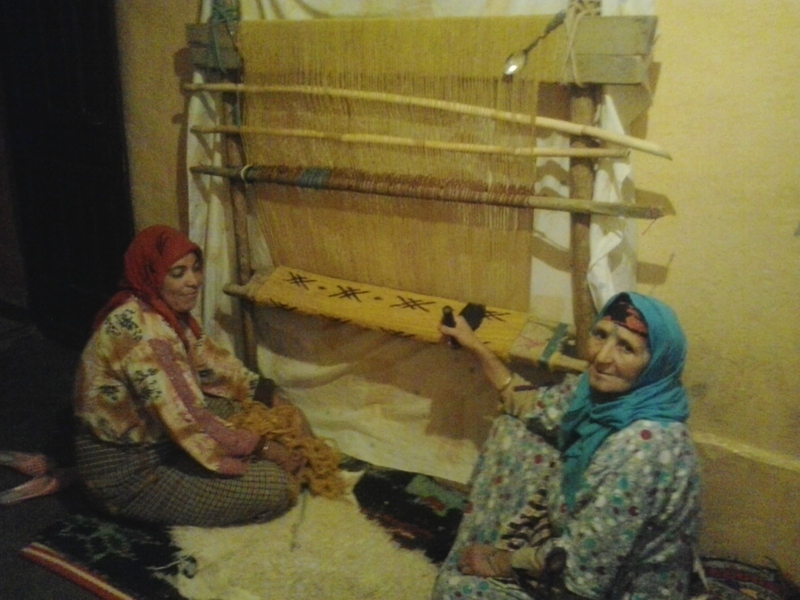 Many projects or social enterprises are implemented in Morocco with the aim of pulling artisans out of poverty. But the troubled fact is that these projects almost always focus on bringing costly outside skills to support individual artisans. These efforts and their focus on individuals, rather than a community, further isolate artisans from each other and instill the belief that help can only come from abroad. The reality is that many Moroccan artisans already have an immense amount of skills. But in the absence of a community, these skills are siloed throughout Morocco. If artisans were part of a community in which they were encouraged to support and learn from each other, it could create the most cost effective solution in building artisan capacity — and wealth — at an unprecedented scale. Building this community of artisans in Morocco is at the heart of Anou’s vision. 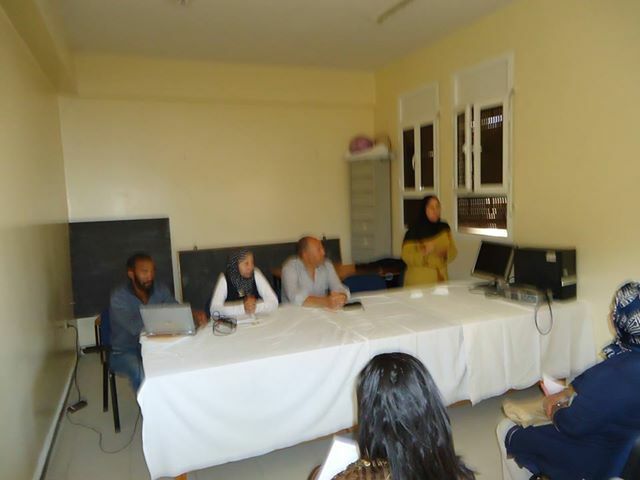 Last month, Rabha (http://www.theanou.com/store/3), one of Anou’s artisan trainers, arrived in Meknes to begin training artisans how to use Anou. For her trainings to be successful she knew that she couldn’t just train individual artisans, instead, she would have to begin building a community of artisans that could support and learn from each other. When Rabha finished training Omar Zidou (http://www.theanou.com/store/25), the first Anou trainee in Meknes, she asked him to help with the next training. Rabha and Omar meet in Meknes before training Hicham. Omar and Rabha then worked together to train Hicham Zaidi (http://www.theanou.com/store/24) and his collective of metal workers. Throughout the training, Omar was able to impart his experience and his perspectives in order to help support Hicham as he got online for the first time. As a result, Hicham quickly learned from hearing multiple perspectives, and Rabha and Omar refined their own skills by teaching. Most importantly, however, was that the training challenged the assumption that artisan craft is a zero sum game. Rabha and Omar help Hicham learn the basics of photography on Anou. Creating this environment of mutual support is critical for building a flourishing artisan community. Etsy’s success, for example, was fueled largely in part by the strength of its community. American artisans created and filled numerous message boards, forums and blogs, which paved the way for other artisans to sell successfully on Etsy. Not only did this create a common culture and strong community among sellers, but it also substantially increased the wealth of the artisan community in America. This year, the community of artisans on Etsy is expected to sell over $1 billion in art. Message boards and forums, however, aren’t tools many Moroccan artisans can use for obvious reasons. Even if they could, it is common in Moroccan culture to almost always seek advice from people they trust and know in their community such as fellow artisans, friends, or family members – not strangers online. This is why it is so important to connect artisans like Omar and Hicham with other artisans within their local community that they can meet in person. Training Omar and Hicham represented only nine artisans in Meknes, but it marked an important first step in creating a larger community. After Rabha’s training, Joauad, the president of a local association that represents many artisans reached out and offered to help. He had heard of Rabha through Omar and Hicham and wanted to ensure that all artisans in Meknes had the opportunity to learn how to sell online. 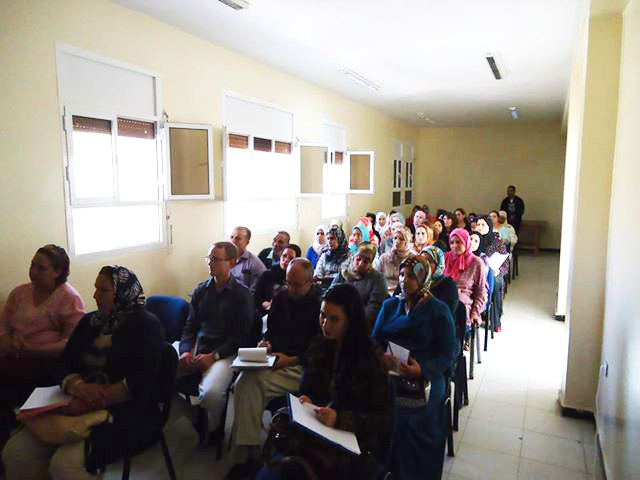 Within one week, Rabha and Jaouad had 50 artisans scheduled to attend a presentation on Anou. To help with the presentation, Rabha invited two other successful Anou artisans Mustapha (http://www.theanou.com/store/9) and Kenza (http://www.theanou.com/store/13). Together, the three Anou artisans demonstrated how Anou worked and outlined the site’s vision of creating an artisan community in Morocco. It was no surprise when all 50 artisans signed up to be trained; the artisans wanted to join something larger than their own cooperatives or associations. Anou trainers, Rabha, Kenza, and Mustapha (pictured below) provide Meknes artisans a walkthrough on how Anou works and answer any questions from the audience. Apologies for the blurry photos! Of all the people at the meeting, no one was more excited than the local representative of the Moroccan Ministry of Artisans who happened to attend. He had tried building a site for Meknes artisans in the past but it had failed. After seeing three artisans, from rural villages no less, demonstrate how the site worked, he wanted to get involved and invited Rabha to meet his staff at his office. During his meeting with Rabha, the Ministry of Artisans in Meknes committed to sponsoring a meeting of all Meknes artisans and also committed to providing an internet equipped computer lab free of use for any artisans in Meknes who want to use Anou. Within just a couple of weeks, Rabha, a rural artisan, gathered artisans and existing resources to lay what will become the foundation of a thriving community artisans in Meknes. All of the success Anou has had in Meknes wouldn’t be possible if it weren’t for artisans leading the site. When artisans present Anou or lead trainings, it creates a belief amongst the artisan community that artisans are capable of becoming more than just labor. But more importantly, an artisan led site — while it can sometimes slow Anou’s growth — enables Anou’s artisan trainers to build real world experience managing a complex organization and develop extensive knowledge of the needs of artisans. 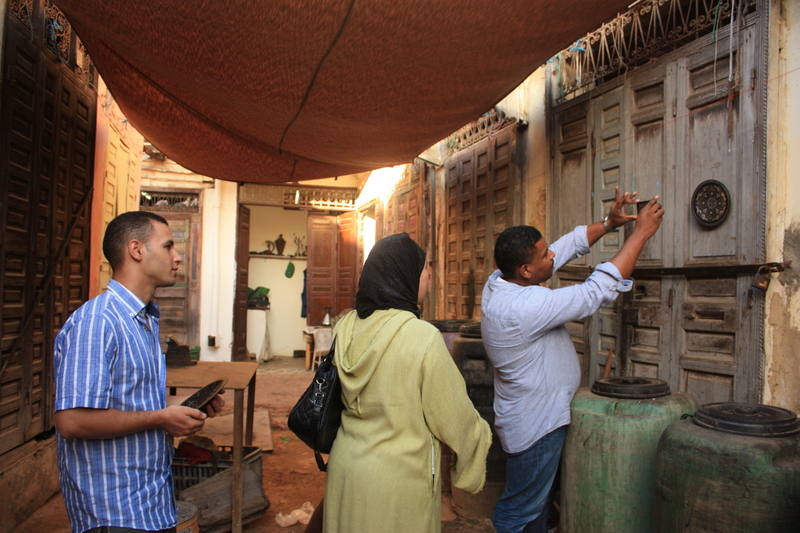 In turn, they invest this knowledge back into the rest of the community so that every artisan in Morocco can benefit. One does not need to look further than what Rabha and Brahim (http://www.theanou.com/store/5) have done with their leadership positions in Anou for proof of the impact that Anou’s artisan team can have. While artisans are a vital cornerstone to Anou’s success, so are you. Each time you make a purchase on Anou, you’ll not only receive an amazing hand-made product and support an incredible cooperative of artisans, but you’ll also be funding the growth of Anou’s artisan team as they work to build a vibrant, sustainable artisan community throughout Morocco and beyond.